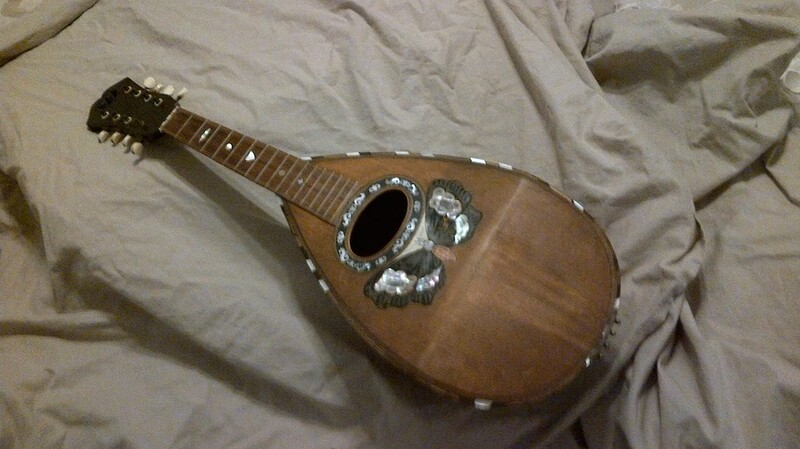 I bought an antique Italian bowl back mandolin today. The top has separated from the bowl in the area of the bridge and will need to be re-glued when I figure out why it has moved. The mother-of-pearl and tortoise shell edging is about half missing but since both are restricted materials I will probably re-edge with contrasting exotic woods. So today I removed the old strings, oxidized black and mapped out some of the work I need to do so that I can make a logical plan. More pictures as I progress. Congratulations, Ray! It's lovely. 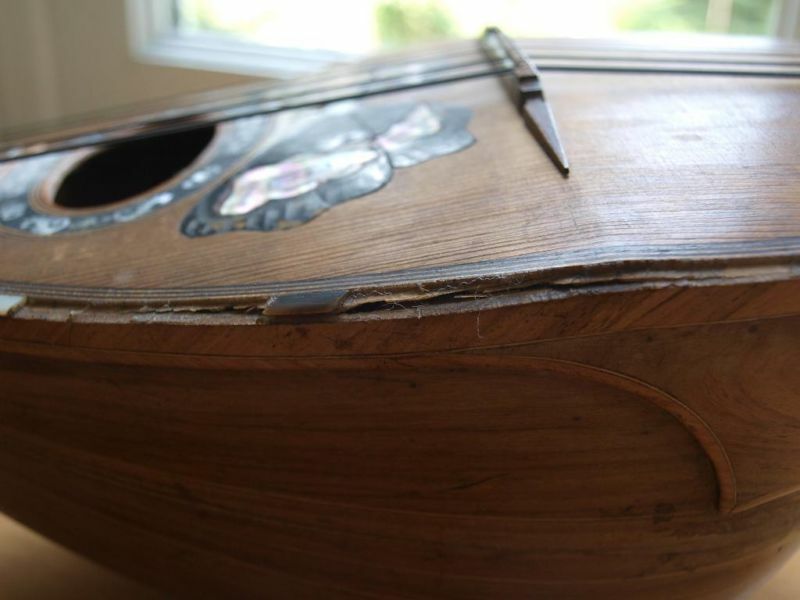 I'll be interested in hearing about your restoration efforts and eventually hearing you play it. Very nice. I'm thinking first or second decade of the 20th Century? Do you know anything else about it? So happy for you Ray!!! Woot woot. Awesome score, Ray. Nice inlays! That bridge is highly cool as well, don't think I've ever seen one quite like that. That's a beautiful instrument you got there! Excited to possibly hear it sometime! Very nice instrument. Good luck on the repairs. Thanks to KS, Uzi, Tucs, CPO, DanielB, RosinGeeko, and Pierre for looking in. The only date I have for the builder Francesco Salamone is 1890 in a EBay Ad so I am not swallowing it yet. Early 20th century seems right so it might technically be an antique. The seller a new university grad said it was his father's so the provinence is not extensive. 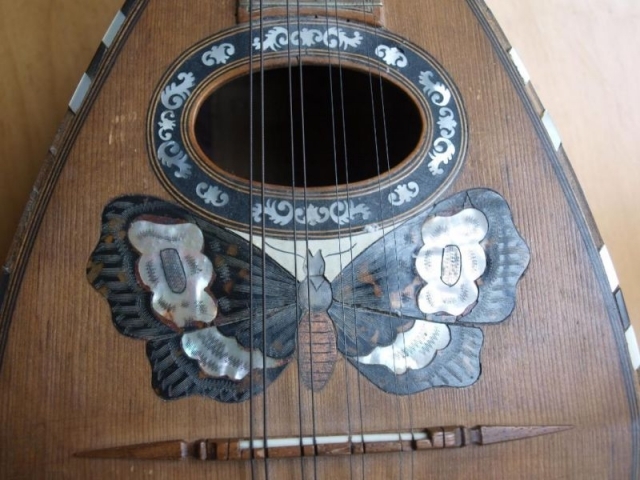 Dave the Mandolinluthier says Salamone was not a premier builder but the instrument looks like it was a premium item from that shop. It is a premium item for me. I bought some new brass pan-head screws. Where screws are used they are actually counter sink screws and in all cases they hold down either metal tuner covers or metal tail pieces which were never countersunk. These new screws after blackening in a vinegar atmosphere for a day or so, wont stand so proud nor offer a place to snag cloth or skin. Also bought some clamp tape designed to keep clamping pressure on irregular shaped items like mandolins until glue has dried. New ultra light strings are on order. These mandolins may have bridged the change from gut to steel strings but they don't handle the tensions of ordinary modern strings. Will take some detailed closeup pictures of the individual challenges I will be working on and thanks again for checking in.